Pinay WAHM: Blogger Award...a TAGGGGG!!!!! Actually it's called: Breaking Blogger Award 2011 and Nancy just handed it to me virtually, of course. Thanks much Nancy. It's been ages since I last posted a tag so this will be a whip of fresh air...to me anyway. I was a wee bit hesitant to post it since one of the 'rules' of the tag is to tag other bloggers. I don't blog hop as much as I used to anymore and I'm afraid I won't be able to fulfill that part of the deal. But I got Nancy's 'nod' that it's okay to post without the 'tagging' part. Anyway, another part of the tag is the '7 things about me'. That's anothe r hard part because I've done quite a few of them as well in the past. So....I'll just randomly list 7 things about me....regardless of whether I've already blogged about it or not. 1) My blog is called 'Pinay WAHM' because I'm a Filipina [Pinay] Work-At-Home-Mom. 2) I've been a WAHM for the last 7 years or so. 3) I used to be Math teacher in my former life. 4) I found my WAHJ [work-at-home-jobs] by searching online. I think I applied to everything that I thought I was qualified for until I got my first break. I didn't have any 'connection' or 'backer' contrary to what others may think. 5) I'm an NCIS fan. I don't get tired watching even the re-runs. 6) I'm married to 'McGyver'. 7) I get nervous easily. That's it. 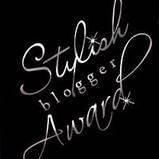 Now...if you think you're a 'Stylish Blogger'...why not grab this award and do me a favor. Thanks again Mommy Nancy! You're welcome! Simply but very well described Mommy J.
Talaga? your hubby's name is McGyver? hahaha! I used to be a big fan of this series kasi, hehe! Tama ka J! Favorite ko si McGyver, ang mahusay gumawa ng mga paraan! But I suppose your comment in mine is meant for Nancy. he he..
Swerte mo naman talaga, Jack of all trades si M! Lahat ng problema may solusyon! Tunay ngang isang McGyver! Super bilis talaga ng araw! Di ko nga maabutan eh! he he..
Another happy Monday to you again Huling!